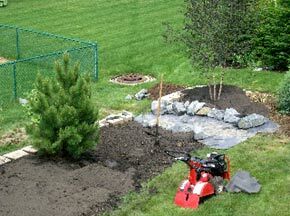 6-30-05 – The only thing more fun than starting a new landscaping job is FINISHING one. 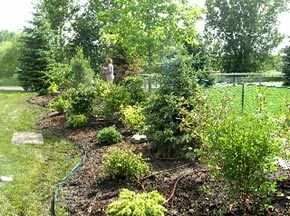 Job #1, Suburban Back Yard, is done! 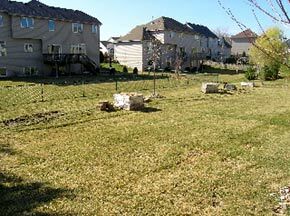 In case you are joining the project updates for the first time, the client had a plain grass back yard that bumped up to her neighbor’s chain link fence and his back yard. The view from the yard was ghastly; from her oft-used deck, it was gruesome. 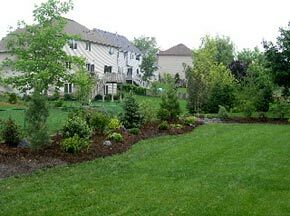 To catch up on the first two chapters of this landscape’s planning and development, click here. 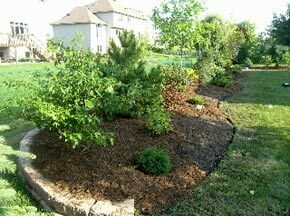 The client is a very good gardener—she will select and plant the perennials and annuals that will fill the soil beds you can spot curving through the front of the raised bed. 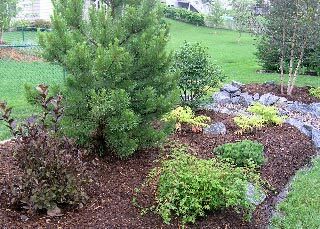 Plant your trees first, here a compact Norway pine and clump birch. 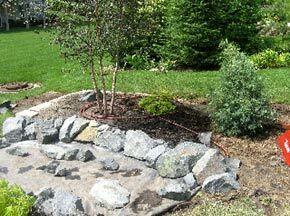 Note early definition of functional dry creek bed. 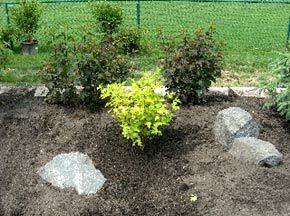 Place larger background shrubs and rock outcroppings next. 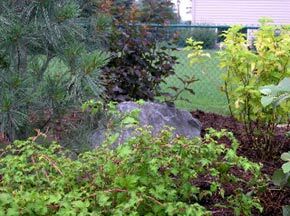 ‘Dart’s Gold’ ninebark in front of ‘Monlo’ ninebark, the oldest trick in the book. 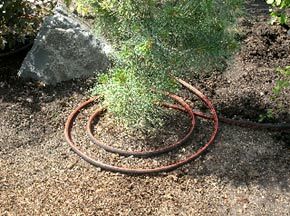 Drip irrigation was installed before mulching, trees circled twice, shrubs once. 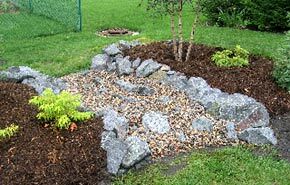 Note advancement of creek bed installation. Renegade foreperson Judy fiddles with her cell phone when she should be finishing installation of aluminum edging. 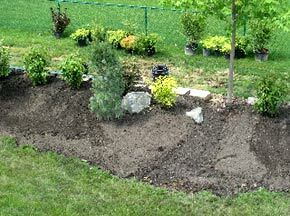 Note curving soil beds where homeowner will plant perennials.